Google’s heading into the Pharmaceutical Industry, as they’ve made a partnership with Novartis to produce the Google Contact Lenses for which they’d applied for a patent back in April 2014. Alas, no mini-cameras will be in these Contact Lenses. Instead, Google is designing them with the help of Novartis Pharmaceutical know-how to monitor Blood and Glucose sugar levels for Diabetes patients and relay that info via Bluetooth to a smartphone App. This deal is really between Google Project X Team and the Alcon eyewear division at Novartis. They’ll be designing a small Contact Lenses that contains a low power microchip with gold-wire hair thin electronics circuitry and antenna. In collaboration with Novartis’s Alcon Team, they’ll design Glucose measuring technology into the Contact Lenses to measure the Blood Sugar level of diabetics directly from Tear fluid that flows on the surface of the eyeball. Then a Bluetooth or possibly NFC (Near Field Communication) link between the Contact Lenses and the patient’s smartphone will communicate their Glucose level to a customized App, thus keeping them informed and alerting them of any danger of the Blood sugar level going out of control. And yes, as I’d predicted, it may eventually gain, in the future, a camera-like functionality, that can not only take pictures like the Google Glass but also extend your range of vision by basically adjusting to changing constitutions of the eye.It might even involve sending signals to a built in device in the future implanted within the person’s tissue to release Insulin that is stored in a compact container in a controlled manner, thereby eliminating the need for patients to administer it via injections. Future applications of this technology may involve the detection of other diseases by analyzing the tear duct fluid. Imagine myopic (short-sighted), astigmatism and long-sighted suffers being enabled with a pair of Contact Lenses that can automatically adjust themselves to correct their vision and even magnify objects that are very far away with eagle-eye binocular vision. But its greatest potential is straight out of Star Trek – The Next Generation; enableing the Blind to see again by acting as a replacement for their eyes, with direct connectivity to their Ocular Nerves, Geordi La Forge Style. Folks, Google Contact Lenses made with the help of Novartis may be effectively a cure for blindness in the next five (5) years, the expected development cycle for this product.It may even allow them to see at night and being as its got Bluetooth connectivity; it may also be able to record and stream video to your smartphone in a manner currently done by the Google Glass. Industrial and Military Applications can obviously be seen here, for those with an eye for the imaginative. May 2014 saw UC Irvine School of Medicine become the first medical school in the United States of America to utilize Google Glass into their Teaching curriculum for their Medical courses. 1st and 2nd year Students will use Google Glass for Anatomy Class and 3rd and 4th year Students will use Google Glass during their hospital rotations. As for the Google Contact Lens project Novartis Chief Executive Joe Jimenez in interviews with Business Week and Wall Street Journal expects to quote: “…be able to commercialize it within about five years….”, with huge financial returns in the next five (5) years. After all, if it wasn’t that good, Novartis would not be in this partnership to make a beta product. When finished, this will be a ready-to-use prescription eyewear that’ll be sold in pharmacies all across the US of A and with regulatory approval, EU, Canada and eventually Developed World Countries like Jamaica. 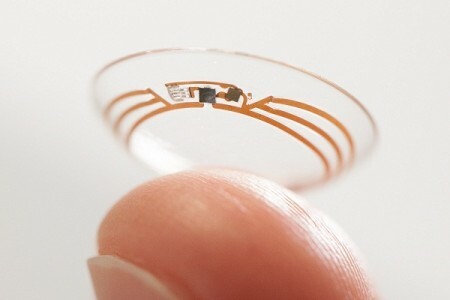 With such positive developments for Google Glass pre-2015 Launch, I’m expecting greater 20/20 forward thinking visionary concepts from the Google Project X Team and the Alcon eyewear division at Novartis as they breathe life in this Google Contact Lens that’s a cure for Blindness in the Future.